A strange little indie comic done in black and white and I love the graphic design; everything is so big, characters and text. 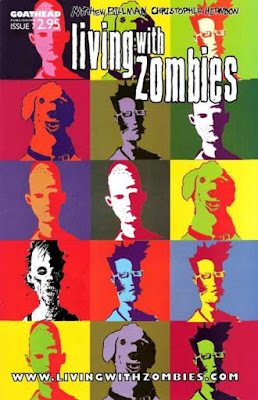 Zombie apocalypse thing which is more humour than horror but includes a good dose of violence. Can't really get a sense of plot (if there is one) by jumping in at issue #7. I'd read the beginning issues, though, if I came across them. 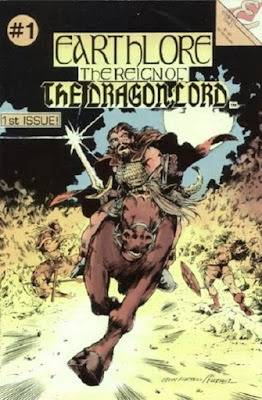 I'm not overly into fantasy these days but this indie comic from the 80s is an intriguing beginning to a high fantasy plot. Perhaps of the sword and sorcery variety (there is a mage but no magic yet), this promises to be an intricate story. Opening with the invasion of a castle, the king and heirs dead, the remaining princess is spirited away to her half-uncle's farm. The background story is imparted as an explanation to the young princess. She and her uncle are the only surviving heirs to the throne and tomorrow they will decide which one of them it shall be, with neither wanting the title. Printed on newsprint in black and white, this old-school tale feels promising. I had never heard of this series before but have read some of the author's "Angel/Buffy" books. This was great fun and I really liked it. Written in 1991 it is classic space opera fare with a fun plot, tons of tongue-in-cheek humour, and parody. 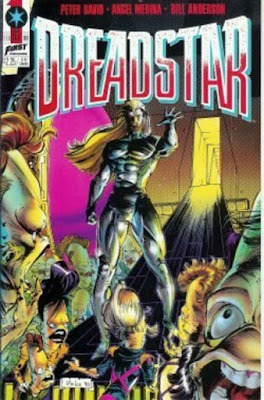 A character who looks like Bart Simpson has a bit part and the book ends with the invasion of a crew of aliens who resemble the entire crew of the original Star Trek with the leader named Tibrus, obviously take from Kirk's middle name Tiberius. I'd love to read more of this series.